NASA's Spitzer Space Telescope has captured this stunning infrared view of the famous galaxy Messier 31, also known as Andromeda. Spitzer's 24-micron mosaic (main image) is the sharpest image ever taken of the dust in a spiral galaxy, other than our Milky Way. 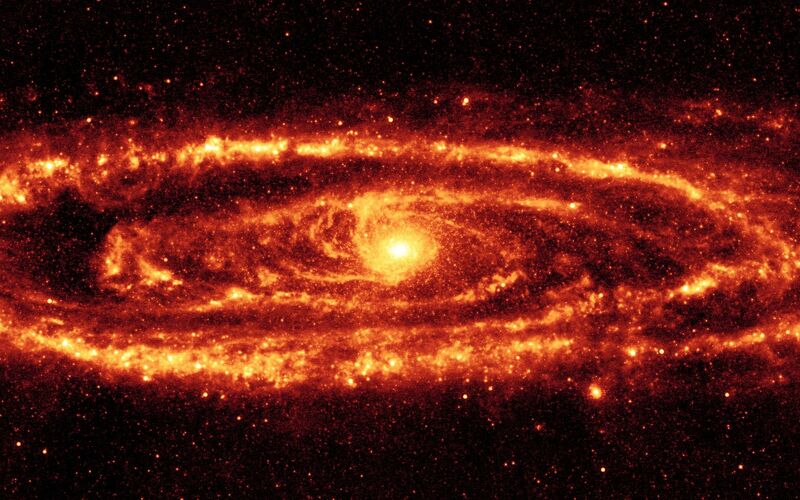 Asymmetrical features are seen in the prominent ring of star formation, which appears to be split into two pieces, forming the hole to the lower right. 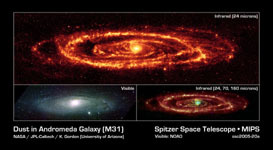 These features may have been caused by interactions with satellite galaxies around Andromeda as they plunged through its disk. 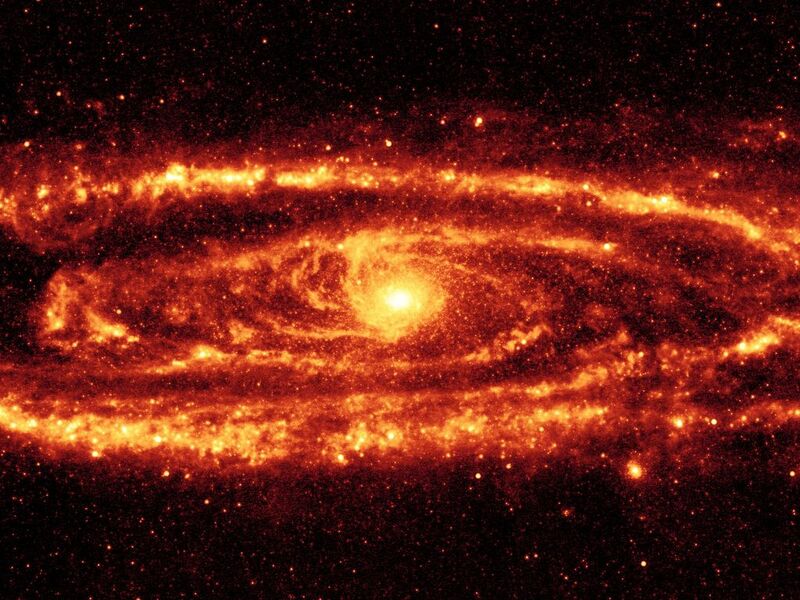 The multi-wavelength view of Andromeda (figure 2) combines images taken at 24 microns (blue), 70 microns (green), and 160 microns (red). Use of all three bands from the multiband imaging photometer allows the astronomers to measure the temperature of the dust by its color. The warmest dust is brightest at 24 microns, while the coolest is most evident at 160 microns. The blue/white areas have the hottest dust, as seen in the bulge and in the star-forming areas along the arms. The cooler dust floating in the ring and arms are the redder regions. 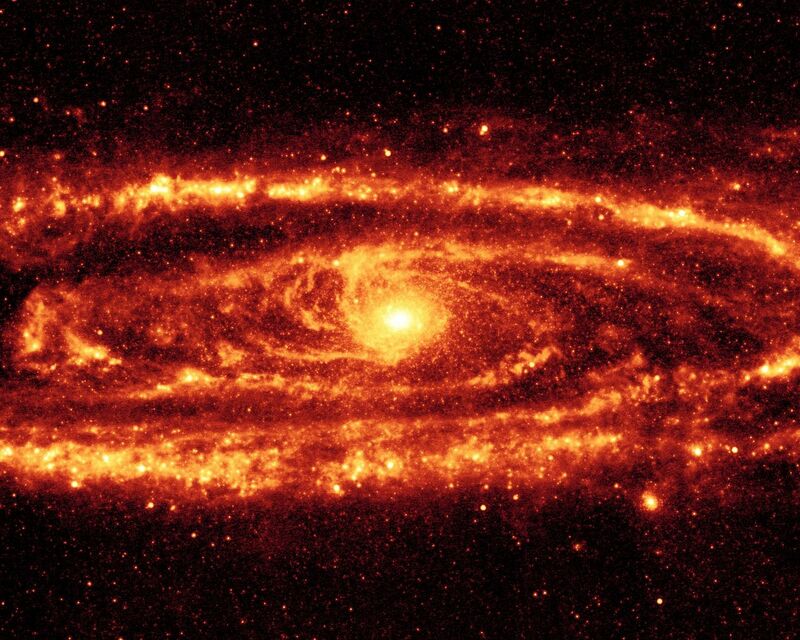 This is a dramatic contrast to the traditional view at visible wavelengths (figure 3), which shows the starlight instead of the dust. The center of the galaxy in this optical view is dominated by a large bulge that overwhelms the inner spirals seen in dust. The dust lanes are faintly visible in places, but only where they can be seen in silhouette against background stars. The data were taken on August 25, 2004, the one-year anniversary of the launch of the space telescope. The observations have been transformed into this remarkable gift from Spitzer -- the most detailed infrared image of the spectacular galaxy to date.